In the past three years, nearly 1,500 elephants died on the grounds of Kenya's Tsavo National Park, many of whom fell victim to rampant poaching. But amid the slaughter, one bull elephant there has defied the odds by refusing to succumb to four separate attempts on his life -- emerging as a symbol of hope. Mshale, thought to be around 40 years old, was first targeted by poachers in November 2012, struck with a poison arrow that lodged deep into his flesh. Somehow, Mshale managed flee with his life, finding refuge at an outpost for orphaned elephants where a veterinarian from the David Sheldrick Wildlife Trust was able to remove the arrow and treat him for his injuries. Following that incident, Mshale became a regular visitor to the outpost, apparently understanding that their presence there was to help. It wasn't long before the large elephant was targeted once more. In March of last year, rangers patrolling the park by aircraft spotted Mshale limping across the savanna and rushed a team out to help him, again discovering that he had been be struck with an arrow. After this second sharpened object was extracted, the elephant quietly acknowledged his rescuers. "He stood gazing at his human helpers for a few minutes and then with a knowing look he limped back off into the bush," writes the trust. A few months later, in August, the trust notes that Mshale was treated for yet another poison arrow wound by a mobile response team. And just like each time before, the elephant stoically disappeared back into the bush, by now well aware of the dangers. But unfortunately the poachers returned as well. Last month, Mshale stumbled into the outpost showing signs of injury more serious than before -- two deep stab wounds to his back, likely from a poacher spearing him from a tree. "Because he has been treated three times before, and he knows where help lies, we believe Mshale came back despite his poor body condition so that he could be treated and saved one more time," the trust reports in an update. "He had two large and deep spear wounds which had to be cleaned. One had passed right through his ear deep into his neck, the other into his back," adds director Rob Brandford. After a vet cleaned the wounds, a weakened Mshale wandered off with his companions to meet the uncertain fate that awaits him in the wild. Now weeks later, rangers conducting aerial surveys of Tsavo's elephant herds have yet to spot Mshale since this latest incident -- a heartening sign that he is still alive. Sadly, despite of the scars of previous attacks, Mshale value in the eyes of poachers has yet to diminish. Driving the violence is the elephant's large tusks, weighing in at around 100 lbs. According to an estimate in the Express, poachers would stand to gain $16,000 from Mshale's tusks. Given the scale of poaching in Africa, which claims around 36,000 elephants every year, working to defend these animals from the illegal hunting might at times seem like a hopeless task. But as long as elephants like Mshale continues to endure with the odds stacked against them, conservationists, like those with the David Sheldrick Wildlife Trust, will be there to help them through. 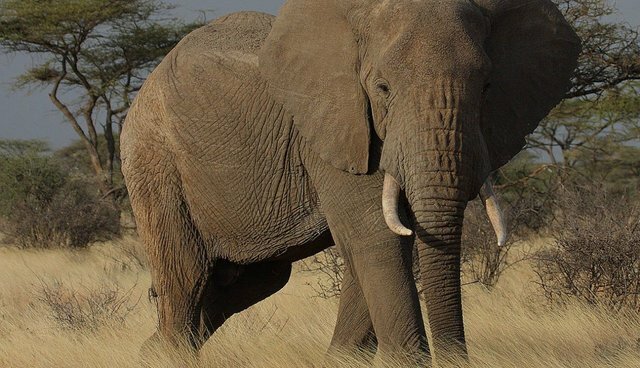 "This incredible bull elephant is not giving up – and neither are we," says Brandford.